On the evening of August 17, Shanghai Ballet presented its original production Echoes of Eternity in London Coliseum. Chinese Ambassador Liu Xiaoming, together with an audience of more than 1500, watched the performance. 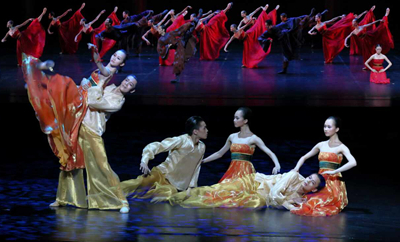 The modern ballet Echoes of Eternity was an adaptation in 2015 from the eponymous poem written by poet Bai Juyi of Tang Dynasty. It features choreography by famous German director Patrick de Bana, costume design by Agnes Letestu and light design by James Angot. National First-class performer Wu Husheng, Chief dancer of Shanghai Ballet, played the role of Emperor, and leading ballerina of Shanghai Ballet Qi Bingxue, gold medal winner of the 5th Shanghai International Ballet Competition (adult group) played the role of Lady Yang. Other main performers include Zhang Yao, Wu Bin and Zhang Wenjun, playing the parts of "Gao Lishi", "Chen Xuanli" and "An Lushan" respectively. Solo dancer Zhao Hanbing played the Fairy Moon, witness to the love between Emperor Xuanzong and LadyYang Yuhuan. The stage design was inspired by Chinese ink and wash painting, setting off the brilliant costumes in sharp contrast. The performance of Wu Husheng was particularly spectacular. No longer the graceful gentleman of his past roles, his emperor was arrogant, lonely and desperate. Qi Bingxue's crisp and elegant dancing showed Lady Yang's braveness and pride along with her gentle and smart character. Zhang Yao's delicate expression of GaoLishi and Zhang Wenjun's intense performance of An Lushan were both laudable. The captivating performance of the dances moved the audience and enhanced the artistic influence of the production. After the performance, the audience expressed their gratitude with enduring applause. 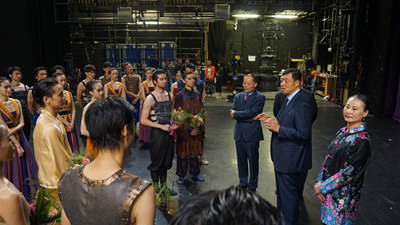 Ambassador Liu Xiaoming visited the cast after the performance and offered his congratulations. He recalled Shanghai Ballet's debut of Jane Eyre in London three years ago, and hailed the progress in China-UK relations during the past three years. Last October, President Xi Jinping paid a state visit to the UK and ushered in the "golden era" for China-UK relations. Both countries are committed to pragmatic cooperation in the fields of politics, economy and trade and culture to boost a sustainable and win-win China-UK relationship. By bringing the Echoes of Eternity to the UK, Shanghai Ballet is once again giving the British audience a brand-new ballet experience, and telling the Chinese story in a lingua franca. This will for sure add splendor to the cultural and artistic exchanges between China and the UK in the "golden era". The Echoes of Eternity is one of the "Shanghai Season" events held by the art center of Shanghai Opera House in London. It will be giving five performances in London Coliseum from August 17 to 21.